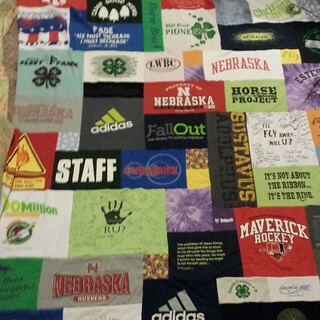 My sister Hannah is graduating from high school this year and she asked me last summer if I would cut up her t-shirts and make a t-shirt quilt. I said yes, expecting that she wanted a t-shirt quilt with all the t-shirts the same size and lined up on the quilt in an orderly fashion. Then she showed me what she wanted. That was a different story. The t-shirts in this quilt were all different sizes. I would look and look at that quilt and couldn’t figure out how those pieces fit together! After some digging, I found a site online that sold a book explaining how to sew all these t-shirts together with out interfacing *gasp! * and how to fit all those odd size t-shirts together! It took me awhile to just pay for the pdf version of the book….being the quilter I am, I thought I could just figure it out! When I did bite the bullet and buy the book I was really glad that I did! It helped so much through every step, and I know that I couldn’t have figured it out on my own! This was one of those quilts where you work on it one day…..and then because you don’t really know how to start the next step you set it aside and work on other things until you finally pull the quilt out again and figure it out. The cutting part took me two sessions partly because Hannah had more t-shirts to add to it, and I couldn’t start planning out this quilt until I had all the blocks. I found though when I started sewing the t-shirts together they went together sooooooooo fast! I was a little nervous not using interfacing, but the book had great tips on the sewing, like always,always holding your top and bobbin thread when you start a seam…that was a life saver! It warned that you might need to practice unsewing…..and I thought “yeah…I am gonna skip that part”. It was actually a miracle! I didn’t ever have to touch that seam ripper. 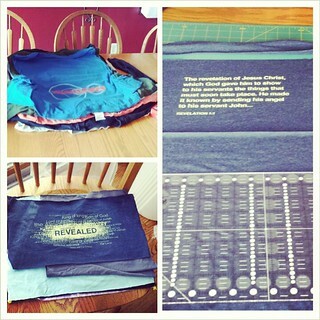 Here are first two sections.It was so cool to see the T-shirt quilt coming to life as I sewed! It literally took me only two evenings to sew the whole quilt together when I finally made up my mind to do it! 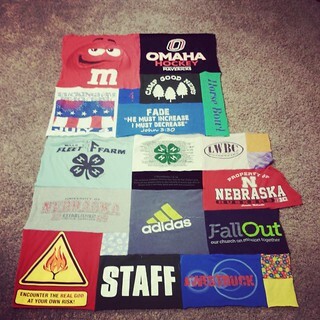 Here is a rough picture of the finished quilt! It ended up roughly 72″ by 92″. When it gets quilted I will post a better picture. Stay tuned!